1 Y 2 DE DICIEMBRE - I TORNEO DE PÁDEL " TU SÍ QUE VALES "
on 12 Noviembre 2012 . 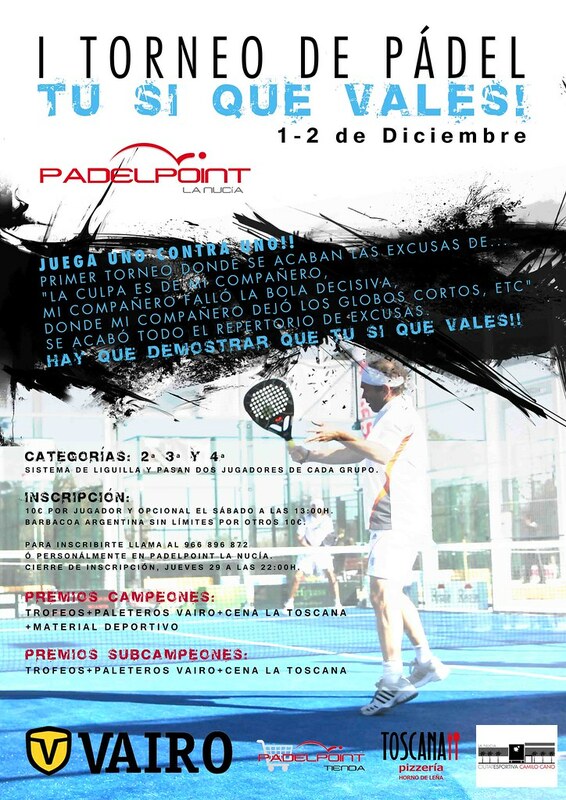 EL I TORNEO DE PÁDEL " TÚ SI QUE VALES " SE VA A DISPUTAR EN PADELPOINT LA NUCÍA EL 1 Y 2 DE DICIEMBRE. EL PRECIO DE INSCRIPCIÓN ES DE 10 € Y EL SÁBADO HABRÁ BARBACOA ARGENTINA AL MEDIODÍA CON UN COSTE ADICIONAL DE 10 €. CAMISETA DE REGALO CON LA INSCRIPCIÓN. CIERRE DE INSCRIPCIÓN: JUEVES 29 DE NOVIEMBRE A LAS 22.00 HS.